This soup has only 6 ingredients...corn, onion, garlic, a chile, coconut milk, and a squeeze of lime juice. I am excluding the salt, pepper, and water of course, and yes, so I added a little basil oil, but even without the basil oil, this soup sings summer. The secret to coaxing such a rich corn flavor with so few ingredients is to make a quick corn stock. Just like you can make chicken stock from chicken bones, shrimp stock from shrimp shells, and vegetable stock from vegetable scraps, you can make corn stock from corn cobs. You can use the liquid yellow gold that results into a base for a soup like I did here, or into a risotto, or even a summer polenta dish. The chowder is completely dairy free, but the coconut milk combined with the sweet corn makes for a match made in heaven. The chile's heat and lime's tartness cut the sweetness of the corn and coconut, snapping it back into savory territory. I reserve some corn kernels to briefly cook at the end to give the chowder texture, but you could puree everything together if you would like. The basil oil is a breeze to make, and once you can make, you can find a lot of excuses to use it. Drizzle it on tomatoes and mozzarella, bread and cheese, on pasta or rice. You puree basil with olive oil and a little salt and voila! basil oil. I blanched the basil to keep it bright green before blending it with oil, but you could skip that if you did not mind the color change. 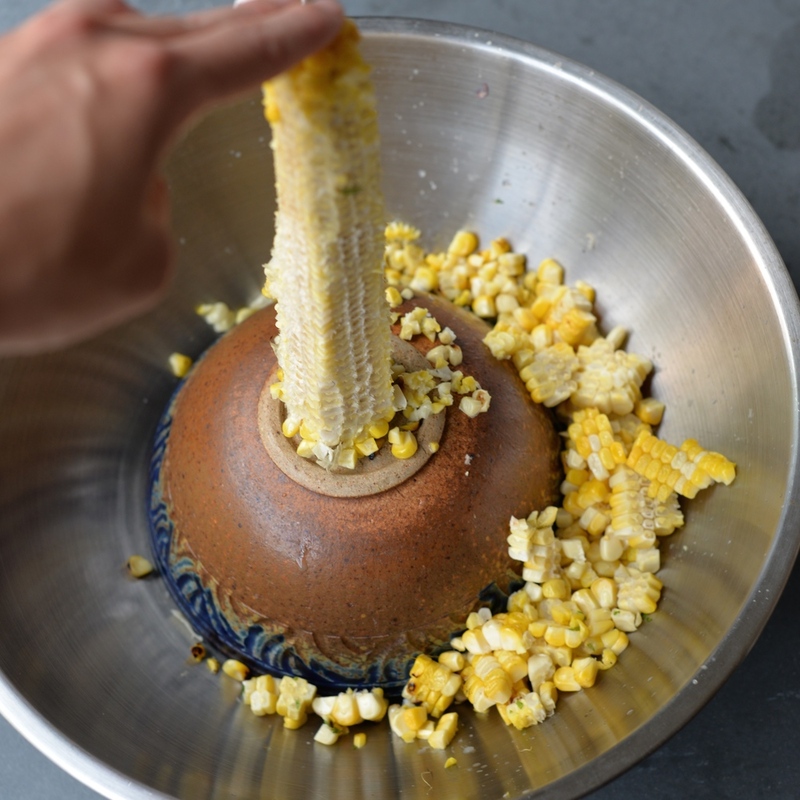 Remove kernels from 4 corn cobs and set aside. Break corn cobs in half. I find this easiest to do with my hands. Make the corn stock. Heat oil in a medium pot over medium heat. Add onion and garlic and cook for 5-8 minutes or until softened. Add chile to onion mixture and and cook 30 seconds. Add corn cobs and 2 cups of water, snuggling corn cobs under water as much as possible. Bring to boiling, then reduce heat to simmer. Allow to cook for 30 minutes. Remove corn cobs from stock and discard or compost. Reserve 1 cup corn kernels and set aside. Add remaining corn kernels and salt to pot and cook for 5 minutes over medium heat. Allow mixture to cool briefly and then add to blender. Add lime juice coconut milk to blender and blend mixture until mostly smooth. Season to taste with salt and pepper. Meanwhile cook remaining corn kernels in now empty pot with a splash of water until just cooked, about 3-5 minutes. Sprinkle with sea salt. Ladle soup into bowls and spoon reserved cooked corn kernels over top. Drizzle with basil oil, if desired. Enjoy! Serves 2-4. Blanch basil oil for 10-20 seconds in boiling water. Cool immediately in ice bath. Drain and pat dry. Add to blender or food processor and add extra-virgin olive oil. Blitz until desired consistency is reached. Add a pinch or two of salt to taste. Can be stored in the refrigerator for up to 5 days. *You can skip the blanching step, knowing that the basil oil will not be quite as bright green due to oxidation. The flavor, however, will not be affected. So you want to know one of my favorite things about summer? Those sheets of corn kernels that fall off the cob when you run your knife down alongside it. There is something so satisfying about their texture. Sure, eating corn right off the cob is pretty fun too, but it can be messy, and kernels get stuck in your teeth inevitably on the day you run out of floss. Corn kernel sheets take the cake for me. If only there was a foolproof way to maximize the number of kernels in a sheet. This corn and zucchini number is pretty awesome. I put a lot of pressure on myself for making the most of these corn sheets other than just nibbling them up by themselves, and I think I did them justice. 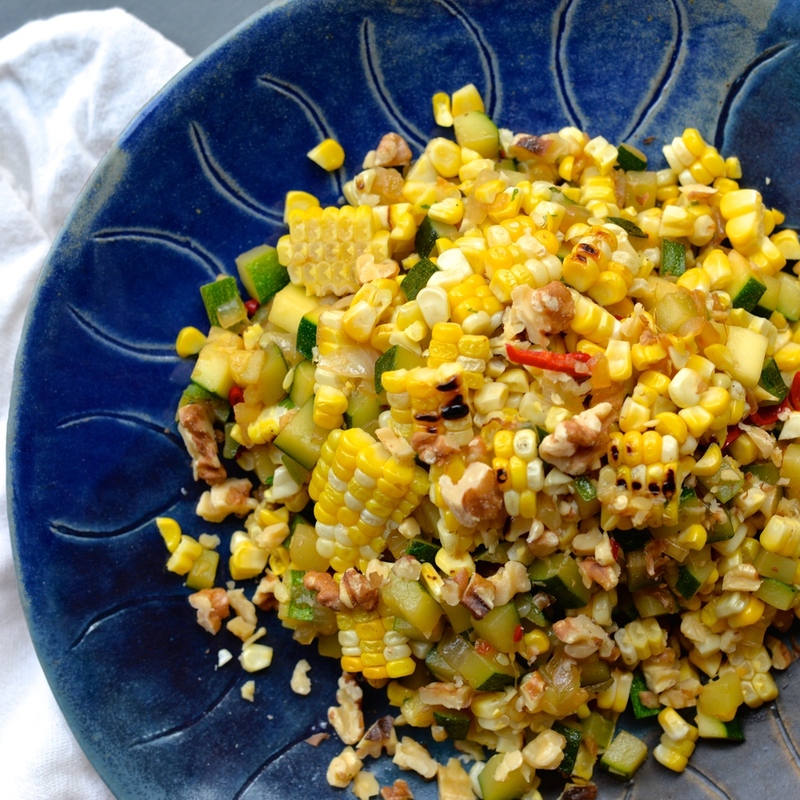 I toss sweet corn, tender zucchini, and a spicy chile with zingy red wine vinegar and buttery walnuts. Simple, beautiful, and really delicious. I promise. Grilling corn, if you have never done it, is so easy. It beats boiling it or even sauteing it because it caramelizes the corn's sugars in the most perfect way. If a grill is not accessible, broiling it is always an option, just be sure to turn it every so often to prevent burning. Preheat grill to high. Alternatively, turn your broiler on high. Rub each ear of corn with 1 teaspoon olive oil. Grill or broil, turning occasionally for about 10 minutes or until lightly charred all around. Set aside to cool. When cool enough to handle, slice corn off the cob, preserving as many corn sheets as possible, and set aside. I use a small bowl turned upside down in a larger bowl to help catch any rogue kernels (see photo). Meanwhile, heat a skillet with 1 tablespoon olive oil over medium- high heat. Add diced onion and garlic and cook, stirring often, until softened and slightly golden, about 5-8 minutes. Add zucchini and 1/2 teaspoon salt and cook for another 5 minutes or until tender but not mushy. Add sliced red chili and cook for 30 seconds. Remove from heat. Stir in 1 tablespoon red wine vinegar. Carefully combine corn and zucchini mixture. Sprinkle in toasted walnuts and season to taste with salt and pepper. Enjoy! Serves 4.